Do you do a single gauge mount? I'd like to do a single gauge for Boost and trans temp then have it override if a preset fault occurs. Its a great gauge. Lots of use of them over on the CTSV and Camaro forums. Its been a long journey but I'm glad we finally made progress. The gauge is awesome and you can monitor all the important information in a snap. I'm just waiting on my gauge pod to come and I will be adding some pic's as well. Please let me know as to how I can purchase one of these and a pod to mount it in. It looks like a winner and I am always happy when I know what my motor is doing. Look up I posted for another forum member. You would use your vent and he would put the pod or pods on it for you. I put his email and Facebook. The gauges are from Aeroforce. Nice work guys ! Look forward to this mod. I must be the odd one out here but I just don't see this gauge as belonging on the beautiful XF interior. It (to me) smells like something you would see in a riced Honda Civic. Sorry, just my opinion, anyway just how often do you need to know air charge or coolant temp? To each their own.. We realize its not everyone cup of tea. But in most performance cars out here, Benz AMG, BMW M series. You at least know what boost is going to the motor and the temperature and pressure of your fluids as that is important to the longevity of your motor.. This become even more important for those of us who have added tuning and pulleys. As I said before, to each their own but we where trying to find something that would integrate into the interior as opposed to something that might stick out to a smash and grab thief. The best part is that it easy to install for the most part and there's no wires to be seen. Also, keep in mind that in a lot of situations, by the time those little idiot lights come on, damage could already occur particularly in a modded car. Very nice work Red. Will you be having these for sale? Or how can I acquire one for my 11. Not knocking the mod, but why not have a tablet mount for an 8" tablet and use a Torque with a wireless OBD transmitter when you're planning on pushing the vehicle hard. And I don't see the logic of why a thief wouldn't just smash the window and steal the gauges as well. They will steal the radio out of the dash so why not these? Not knocking the idea, But where would you install a 8" table where it would be out the way and pretty much stay there in place? A table looks very much like a portable Navigation set up which is the hot thing right now among smash and grab boys along with radar detectors.. Easy to sell or hock for a quick return.. Factory car radio are very low on the list of things stolen.. They would rather car jack you first.. 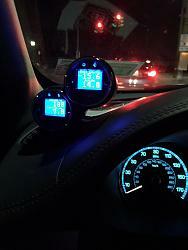 These gauge have low value to the average smash and grab guy because they are more car specific in appearance unless the thief is a car buff.. LOL... You don't have to know anything about a car to know cell phones, radar detectors, Navigation systems, tablets are the things to steal because there easy to get out of your car and fence for a couple of bucks with no question asked. If I'm not mistaken, chXFS posted a link in the thread on how to purchase. 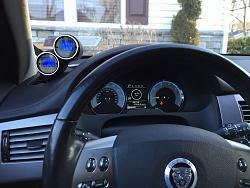 The gauges are from Aerogauge. You can check out a few of their vids on you tube..
My point wasn't to leave it there all the time. Just when you planned on pushing the car more than a normal drive. And I was referring to aftermarket head units not factory. Sorry for not being more specific. Anything "not stock" gets too much attention. Like I said, not trying to bash the mod but I know I don't need gauges all the time. Only when I'm being bad do I like the extra information. When just cruising, I don't. And the tablet gives you the option to use it and then store it out of sight. I know you weren't bashing it but just stating your view point. And like I said in another post, Different strokes for different folks.. I was just expressing a possible way to help some of us get the information we may want without having to do much to get it. I know some guys have taken the approach to using their tablets or phones with wireless connect to get the info when they want it. And if that works for you, all good.. I have a hard enough time remembering to grab my IPod before I leave the house to hear my tunes.. And as for being bad, I don't plan it.. Most times the mood just hits out of the blue, Safety first of course.. If things would go as plan, we may even be able to have the gauges become Jaguar specific so when you start your car it would say Jaguar or something like that with the ability to change data or trouble shoot codes..
... If things would go as plan, we may even be able to have the gauges become Jaguar specific so when you start your car it would say Jaguar or something like that with the ability to change data or trouble shoot codes.. Very clean option but to each their own on this one. I personally would not like this in my car. It's easier to plug in an OBDII bluetooth module and run Torque like I do on my phone (or on another old phone). Gauges completed.Pod by Block8head ...gauge by aeroforce . Yup... Low down nasty weather... LOL.. I was going to try in get it done today but guess what???? It snowed again.. Really..??? This has got to stop.. From what I'm hearing the weather should turn around during the week and I'll get it done. So far I have a shelf full of nice stuff to put on my little girl.. I'll put some pic's up as well as soon as she's finished..